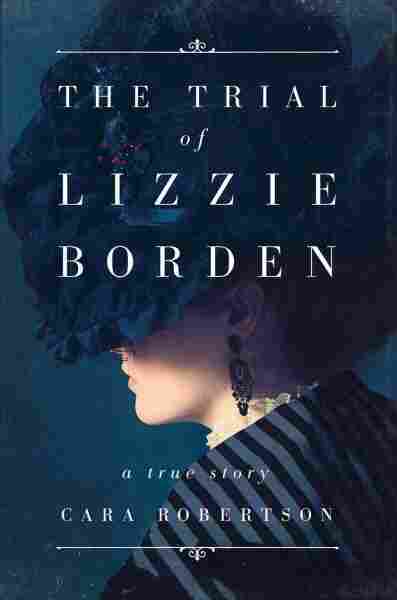 Book Review: Cara Robertson's 'The Trial Of Lizzie Borden' Adds To Fodder To The Mystery Who killed the Bordens more than 100 years ago remains unsolved. Like a lawyer, author Cara Robertson lays the facts and evidence before us, occasionally pointing towards the biases of the day. An odd thing about famous crimes is what details enter pop culture and stay there. People who know nothing about the circumstances surrounding the murder of JonBenét Ramsey, for instance, might well recognize the famous photos of her in full pageant regalia. Those who know little about Charles Manson's behaviors may still quickly think of the Manson Family when asked about cults. As for me, I've always known about Lizzie Borden, it seems, but only because of the grisly nursery rhyme I must have come across in some book years and years ago: Lizzie Borden took an ax, / Gave her mother forty whacks, / When she saw what she had done, / She gave her father forty-one. In fact, whoever gave Lizzie Borden's father and stepmother those real whacks didn't commit quite the overkill the rhyme calls for — there were 10 or 11 hatchet wounds on her father, some 17 on her stepmother. Still, it was a gruesome murder, and one that has become a true-crime obsession much like England's Jack the Ripper who was active around the same time. But just as with the many theories surrounding the mysterious Ripper, Cara Robertson writes in her new book, The Trial of Lizzie Borden, that "[m]ost interpretations [of Lizzie Borden's case] tell us more about the preoccupations of its chroniclers than any essential truth about the mystery." All the more interesting, then, to see how little Robertson herself interprets in this book, which is heavily researched and uses as much contemporary information as it can gather. What is known about the day Andrew Jackson Borden and his second wife Abby Durfee Borden were murdered in Fall River, Mass., is relatively straightforward — and in the first section of the book, Robertson lays out the largely undisputed facts. On Aug. 4, 1892, Borden found her father slain on the couch, blood still wet and body still warm, and alerted Bridget Sullivan, the household domestic servant. Shortly thereafter, Abby's body, colder, its blood already coagulating, was found just as violently murdered in the bedroom then occupied by Borden's biological uncle, John V. Morse, who was out at the time. Emma Borden, Lizzie's sister, was away as well, and so the only two people who were seen in and around the house were Borden and Sullivan. The servant, who was Irish — the first strike against her, in the New England town and its WASP-y anti-immigrant sentiments — and whom the family called by their last servant's name, Maggie — as they couldn't bother to remember the name Bridget, apparently — was the natural suspect for the police, at first. But once they'd ruled her out, they closed their net around Lizzie. The book spends the second, and longest, section covering the Borden trial itself, which is an interesting move and one that feels most true to what we can actually know or infer in the 21st century about events that occurred 127 years ago. Robertson has clearly done her research, and while the actual trial material is absolutely fascinating with its statements and witnesses and arguments by the prosecution and the defense, it was the journalists' takes that kept me most riveted. In our current era, we tend to believe that there was once some standard of journalistic neutrality, but the columnists and reporters who covered the Borden trial for a host of newspapers prove that opinion, observation and speculation have, to an extent anyway, been part of our media landscape pretty much since its advent. "She is, in truth, a very plain looking old maid. She may be likened to a typical school marm, plain, practical and with a face that shows the deep lines of either care or habitual low spirits... There is nothing wicked [or] criminal, or hard in her features." Ralph seemed to have been expecting what was at the time taken to be a scientific fact, that evil and criminality are visible in a person's features, their racial and ethnic makeup, their class. Borden's alleged crime was so shocking precisely because she didn't fit any of the presumptions of what a criminal capable of violence should look like: Not only was she a woman, but she was a white, upper class, single woman in her 30s, churchgoing, and involved in her class's charitable works. Elizabeth Jordan, one of the few female journalists on hand for trial, who reported for the New York World and was one of Borden's staunchest supporters, wrote that "Every picture which has been made of this woman either absurdly flatters her or grossly maligns her." She wasn't wrong. While Borden was acquitted, the mystery of who did kill Andrew and Abby is still unsolved, and lest readers be disappointed, Robertson has no interest in solving this mystery for us. Like a lawyer, she lays the facts and evidence before us, but only occasionally points towards the biases of the day and how these affected the arguments put forth. For true-crime enthusiasts, The Trial of Lizzie Borden is a deeply satisfying read that will give us plenty of fodder to disagree over who-really­-dunit.